Recorded at: Cherokee Studios, Los Angeles Steakhouse Studios, Studio City Sound City Studios, Van Nuys + mixed at Bay 7 Studios, North Hollywood, CA. Pressed at United Record Pressing, Nashville. Comes in a tri-fold jacket. The runout grooves run into the label on almost all copies. I too bought it for collection reasons, sealed. If you have a quality record deck, it’s a total disappointment in comparison to Matador / Music on Vinyl re-releases. Rated R / Lullabies / Like Clockwork / the latest boring one and Them Crooked Vultures, which all sound full of presence and so very revealing. Sadly this is a congested, flattened, boxy presentation, the polar opposite of the landmark music it contains. It’s Radiohead syndrome, whose many vinyl releases are also a disappointment in comparison to their digital counterpart.... but this was the mid 2000’s when the record industry was download crazy and couldn’t care less about vinyl. I’ve requested MOV reissue it, perhaps we could all do the same! Lullabies is such a solid reissue and this neurotic album deserves to be resurrected. Sounds really good. Compared to the CD, the sound is a lot fuller and wider. I believe this is a different mix compared to the CD aswell as the drums are mixed differently in many of the songs. For example, in 3's and 7's the hihat is in the center, not on the left side. Also Sick, Sick, Sick sounds a lot meatier. Higher dynamic range too I believe. Love this album! Don't mind the 10 inch format, it looks cool and unique. Sounds good on my setup. If you can find it for cheap, get it!! My copy sounds fantastic! Bright and balanced with plenty of highs and lows. All depends on your set up and weather you scored a hot press or one at the end of the stampers life. Nice to see the discussion over here. I bought it back in 2007 and immediately discarded it as the worst sounding vinyl I've ever had the displeasure to listen to. 11 years later and hundreds of records later, this one is still the holder of the turd crown. Gimmicky and distorted pressing of an already lo/mid-fi record is a deadly combination. Pressing sounds great to me -- Clearaudio turntable, KEF speakers. Not a huge fan of the 3x10" format on this but the sound quality is fine. Mids are forward but that was the "aesthetic" of the record. Sounds worse than the CD. I have both, A/B tested them and ripped them both to .flac/.mp3. Listened on headphones to both. CD is better quality. More clarity in the cymbals. Then again, this was a low-fi record to begin with. I just got this at Newbury Comics last week (10-12-2017) and it sounds GREAT! I was worried about what everyone was saying. It sounds just as good as the CD mastering goes. And trust me when I say this, because I have the Rated R re-issue on vinyl (rounded corner white box in the top-left) and that sounds HORRIBLE :(. Anyways, I love this record. Era is one of my favorites of theirs, equal to Lullabies to Paralyze. So many memorable tracks - I'm Designer, Sick Sick Sick, Suture, Into the Hollow, Misfit Love, Running Joke. 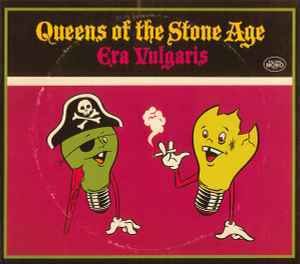 And basically everything else they did in these sessions: Fun Machine, Era Vulgaris, Christian Brothers, MAN! I miss it when they just played in the studio endlessly just because they loved making tracks. Now it seems that they just focus on 10 songs, literally, not even a b-side or cover in sight. And they play the same set lists every night... Ah well. People have said that the needle runs into the center circle, but mine doesn't. It is unusual to flip the record/change the record every 2 songs (literally), but whatever. I like how they experimented with this album. I don't like how ...Like Clockwork was 45 rpm, I would have loved that record on only 1 disc. But whatevs. What I hear compared to the CD is a tad more compression (not terrible, but noticeable), a little too much midrange "honk", and significant distortion in the top end. I won't say it sounds awful, but I really wish it sounded better. Alas, I love this album, and this is the only version on vinyl, so I'll still listen to it and enjoy it, for the most part. Surface noise is no different than most records, sounds fine to me in that regard. I hate that all the runout grooves go into the labels, like they forgot they were making 10" records when ordering the labels or something. Or maybe that was done on purpose, in which case all the extra compression and noisy top end makes perfect sense. "Hey guys, we should totally release this record on vinyl, but put it on three 10" records, package it in a weird top-loading jacket so dust can get in super easy, and let's make it sound ugly!" ... I dig that, if that's the case. Otherwise I'd say this is simply a product of inferior mastering. Rekords Rekords (or Interscope or Ipecac or whoever makes it happen), PLEASE remaster and reissue this on a 12" double-LP! Like, EXTRA pretty please, with extra extra sugar!!! I really hope this is reissued in 2x 12" 45rpm at some point.